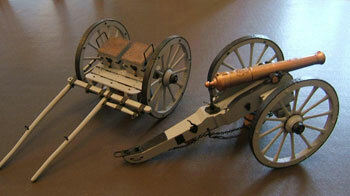 This kit makes up into an impressive model of a Napoleonic 9 pounder Gun and Limber at 120mm scale. The model measures 48cm and has over 167 parts, mostly in resin. Included in the kit is chain, steel rods and copper wire. There is also a full set of instructions giving parts listings by picture and part numbers plus exploded diagrams of assembly detail making the kit suitable for all skills. It is planned, for the future, to release horses and gun crew to further enhance this fantastic model.